Best of the week: news and reviews 29.03.13 | What Hi-Fi? This week on whathifi.com saw more news and debate on the future of plasma TV, two big new stereo speaker reviews, more on the Samsung Galaxy S4 smartphone and plenty more news and reviews. Read on for all the details. Panasonic this week released a statement on the future of its plasma TV business, confirming the company was "looking at a variety of options, but nothing has been decided at the moment". You can read our analysis of how Panasonic plans to continue to make money from its TV business, see the breakdown of the global TV market and read our post on the state of the consumer electronics market that's packed full of fascinating sales figures. TEAC announced it is set to join Cerwin Vega!, KRK and Stanton as part of the Gibson Guitar stable, under a deal announced in Tokyo on Friday, giving the Nashville-based guitar company a 54.5% stake in the company. As is customary for flagship smartphone releases, the trickle of information on the Samsung Galaxy S4 continues ahead of the release on April 26th. The price of the Galaxy S4 was confirmed this week, along with various contract offerings as pre-orders for the phone opened in the UK. The BBC rejigged its HD offerings this week with the launch of BBC Two HD in place of BBC HD. Sky+ HD viewers also enjoyed a reshuffle to the EPG bringing BBC One HD and BBC Two HD together. Don't forget, you can win a Sky+ HD installation and subscription in our new Facebook competition. 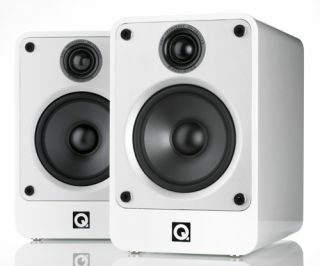 A huge new product from Q Acoustics in the form of these new Concept 20 £350 stereo speakers. Compact, expertly finished and brilliant sound make these a serious contender for top dog honours in 2013. A new pair of Wharfedale Diamond speakers is always big news but sadly these new 155 speakers proved something of a mixed bag. Great sound but dissappointing build means we can't wholeheartedly recommend them. See for yourself in our pictures. The tablet market is booming and Sony wants its slice. The Xperia Tablet S is its latest attempt, ahead of the launch of the Xperia Tablet Z, and pretty good it is, too.